A Weather Protected Control Panel - look for select models with this feature which protects your control panel from rain, dirt, dust and debris. B Outlets - All outlets are circuit breaker protected. Make sure the generator you select has the types of outlets you need. C Fuel Tanks - Larger fuel tanks provide longer uninterrupted run times. Great for homeowners and contractors looking for long operation. D Alternator - Produces the electricity. PowerSurge™ Alternators, available on select models, deliver greater surge wattage for extra starting power. E Engine - OHV(overhead valve) engines provide longer life, longer run times, greater fuel efficiency and quieter running. F Muffler - Helps reduce engine noise. Look for the SuperSilencer™ muffler on select models for extra noise reduction. 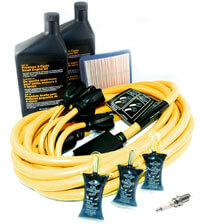 G Wheels - Wheel kits are included with all Briggs & Stratton Power Products generators. Look for larger pneumatic wheels for easier transportation over more rigid terrain - i.e. construction sites. Check our storm ready kit that includes 25ft., 30 Amp Panel Extension Cord, 2 Bottles SAE 30 Engine Oil, 3 Packets Fuel Stabilizer, Air Filter and Spark Plug. 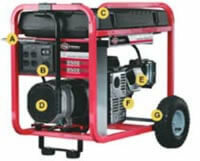 Our generator storm ready kit allows you to maximize the potential of your generator before during and after the storm. 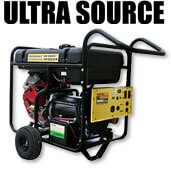 To determine the right generator for you, use the chart below to give some guidance. As a rule of thumb, Amperage x Voltage = Wattage. If you have 10 Amps and 120 Volts then that would equate to 1200 Watts. To make your calculations, print your selector guide here. *** For motors, remember that initial start-up will take from 3X to 6X as much power.